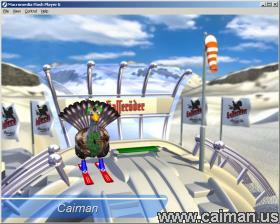 Caiman free games: SkiSpringen by Unknown (for Hasseroder). First enter the names of the fellow players (max. 8 players). Click on "Eintragen" after each entry. After clicking on the "Start" button, the first jumper will be at the first house. 1. 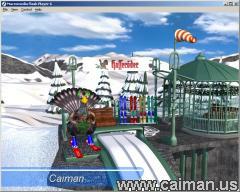 Press the space bar to go on the top of the ski jump. 2. When the wind is low, press the space bar to start gliding. 3. 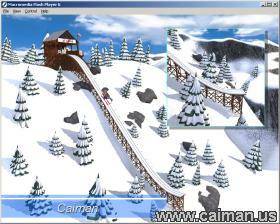 At the end of the ski jump, press space bar to jump off of the ski jump. The later you jump the better the jump will be. 4. 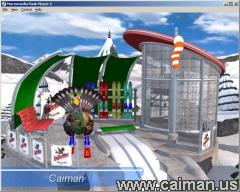 While flying you can use the left and right arrow keys to change the angle of inclination. 5. Just before ground contact upon landing press the space bar for the last time. Typ eerst de namen van de spelers in (max 8) en klik op "Eintragen" na elke input. Klik dan op "Start" en de eerste springer zal klaarstaan. 1. Druk op spacie om de juiste positie in te nemen. 3. Op het einde van de schans, druk op spacie om te springen. Hoe nipter je springt, hoe verder je zult geraken. 4. Tijdens het vliegen kun je de pijltoetsen gebruiken om de springhoek te wijzigen.